From Sept. 21 to Dec. 8, 2018, the Frances Lehman Loeb Art Center is presenting a temporary exhibition titled “Past Time: Geology in European and American Art.” The show features watercolors, sketches, paintings and drawings created by artists from the 1770s to the 1890s, a period during which geology emerged as a distinct scientific field and landscape became a major focus of artistic work. These concurrent developments in the areas of art and science prompted a shared interest in land and geology. The establishment of the field of geology was prompted by a novel scientific investigation of the Earth’s crust (The Frances Lehman Loeb Art Center, “Past Time,” 2018). Geology developed due to a blend of scientists’ interests in the application of minerals, new theories about how the Earth began and their curiosity about how rocks and land features form (The Frances Lehman Loeb Art Center). Artists—especially landscapists—and scientists alike became fascinated by this newfound intensity in our ways of observing the Earth. 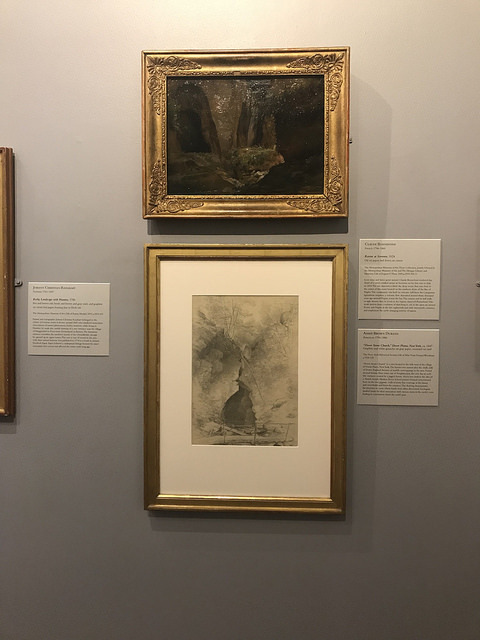 Nineteenth-century artists often began their geological landscape paintings by visiting land features and sketching in field notebooks, which is the same method of observation that geologists use in their studies; some of these artists’ notebooks are featured in the display. The exhibition is arranged according to four geological motifs: caves and natural arches; rocks and rock formations; mountains, volcanoes and glaciers; and cliffs. Although the interests of artists and scientists were harmonious form the late eighteenth to nineteenth century, many still consider the worlds of art and science to be disparate in terms of methodology, purpose and ethos. However, “Past Time” highlights the similar ways in which scientists— particularly geologists—and artists process and study the world. Professor of Earth Science and a consultant and guest contributor to the Past Time Catalogue, Jill S. Schneiderman, is one such geologist for which the studies of art and science are complimentary. She joined Phagan in presenting a gallery talk about the exhibition on Wednesday, Oct. 3, at 4 p.m. The “Past Time” exhibition is in many ways complementary to the A. Scott Warthin Museum of Geology and Natural History in Ely Hall, which features an expansive collection of rocks, minerals, fossils and other artifacts related to natural history. Although “Past Time” is only on display until Dec. 8, the A. Scott Warthin Museum allows students to appreciate the beauty of the Earth’s art throughout the year. Schneiderman urged visitors of “Past Time” to enhance their understanding of the exhibition by observing both galleries. Ultimately, whether one understands the world primarily through a scientific lens or an artistic one, “Past Time” aims to evoke a sense of awe for all individuals, giving us a moment to appreciate nature.